Seeded with alfalfa, grasses offer nutritional benefits and the opportunity to extend stand life. From contacting colleagues in other U.S. regions, Dennis Cherney estimates that alfalfa-grass mixtures are something less than 10 percent of all seeded alfalfa. The Cornell University forage specialist said that’s quite a bit different than the 85 percent mixed stands found in New York. “The most important reason that we do more alfalfa-grass is suboptimal soil drainage,” Cherney explained. “Our winter weather is another issue. About every other year it’s common for alfalfa to break dormancy in the middle of January and this adds stress to our stands,” he added. Both farmers and nutritionists in New York have a comfort level with feeding alfalfa-grass mixtures. “Our feeding trials, as well as those from the University of Wisconsin, indicate that we can get the same or better milk production with mixtures,” Cherney said. Cherney had been telling producers for the past 10 years that the best grass to seed with alfalfa was improved tall fescue. Always seeking a better mousetrap, Cherney currently recommends meadow fescue based on numerous research trials. “Meadow fescue is consistently higher in quality than tall fescue,” the forage specialist said, referring to performance research completed in multiple states. In assessing other grass options for alfalfa mixtures, Cherney noted that he and Mike Casler, a grass breeder at USDA’s Dairy Forage Research Center in Madison, Wis., have been working the past 10 years on a sparse-heading orchardgrass variety. One of the problems with orchardgrass is that it heads out long before the alfalfa is ready to harvest and the quality of the mixture suffers. “Orchardgrass loves the Northeast,” Cherney said. “We’re now down to seeding 1 pound of seed per acre and still often get way too much orchardgrass in our mixtures. I guess we’re going to have to go down to 1/2 pound per acre for a seeding rate,” he chided. In many parts of the United States, alfalfa is cut three to five times per year for three to five years; then the stand begins to lose productivity and it is rotated to another crop. For operations that only want to intensively manage and feed pure alfalfa, three- to four-year rotations generally make good economic sense. There is, however, another road to take. 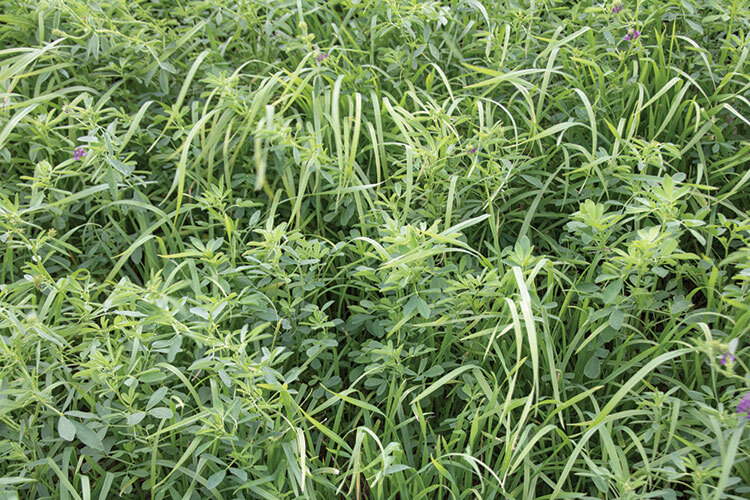 “As an alfalfa stand begins to thin, consider interseeding grasses into it,” said Bruce Anderson, extension forage agronomist with the University of Nebraska. “Not only might you extend the useful life of your alfalfa field by several years, you will develop an excellent hay or grazing source for livestock,” he added. In his area, Anderson recommended seeding cool-season grasses into thinning alfalfa fields from mid-August to early September if soil moisture is adequate. It’s during this time that alfalfa growth is slowing, which provides less competition for the grass seedlings, and temperatures are beginning to moderate. Orchardgrass is often the grass of choice when interseeding into alfalfa, but Anderson also suggested species such as novel endophyte tall fescue, meadow bromegrass, and festulolium. This practice has been put into place on farms as a routine, foundational strategy for extending the useful life of an alfalfa stand. Clayton Geralds, a Munfordville, Ky., hay farmer, was highlighted in the January 2017 issue of Hay & Forage Grower. Geralds, along with his son Christopher, grow and harvest 720 acres of hay for the horse market. Over 500 of those acres are alfalfa-orchardgrass fields that began their life as pure alfalfa. Geralds no-tills 8 pounds of orchardgrass seed in his alfalfa fields after two or three years. This is usually done in September and extends the life of the fields by five to six years. He uses a late-maturing orchardgrass variety that better complements the maturity of alfalfa. At Hedgeapple Farm in Buckeystown, Md., they finish 150 head of grass-fed beef per year. To get the desired 1.8 to 2.2 pounds of gain per day from weaning to finish, they rely heavily on alfalfa as a grazing and hay crop. Pure stands of alfalfa are established and grazed by the growing and finishing cattle. After two or three years, orchardgrass is interseeded to extend alfalfa stand life by three or four additional years. Those mixed stands are grazed but also harvested and wrapped as baleage for winter feeding. Dry bales are also made for maintaining mother cows during the nongrazing months. Alfalfa may come to the dance alone, but there is opportunity to find it a partner in the form of a cool-season grass and keep fields producing for an extended time. This article appeared in the November 2017 issue of Hay & Forage Grower on page 29.